I kind of love these guys. They seem to be of two different species, so I’m kind of baffled about how they might manage to convey information. Not that I can’t imagine more than one way that an animal might do so - far from it (for the record, my guesses include parrot-like speech mimicry, interpretive dance, Braille-like bumps on the back of the thing, tattoos, crazy TV eyes, Morse Code-like heartbeat, semaphore ears and sentient fleas that spell out words. Oh, and information-dense dung deposits). I’m just surprised that the Zinnatese managed to find and domesticate two such beasts before discovering, say, paper. Or the chisel. I don’t know - maybe the Animal Book is just a fancy version of a regular book, like when you get a copy of Dracula with a puffy leather cover instead of in the standard beat-up paperback format. Hell, maybe the bars on those little alcoves are decorative and the ‘Animal Books’ are just regular books that have been made out of animals, sliced up thin. All I know is this: those Animal Books never showed up again, possibly because someone found out that they were being kept in cages roughly the size of a pack of chewing gum. Oh, wait. I also know that every time that Sun Boy came into the library he asked someone to “pass me a disc book from Uranus.” And he found it just as funny every time. The only other interesting thing in this issue were these headers that ran along the top of the page, apparently featuring the mug shots taken after Matter-Eater Lads 19th birthday celebration on Ventura. What a night! Anyway, Adventure Comics No. 337 ended like this: the aliens found Plan R and went home and then it turned out that Plan R was a fake, as were the Legion weddings. It had all been a ruse to get the location of Munster Planet. 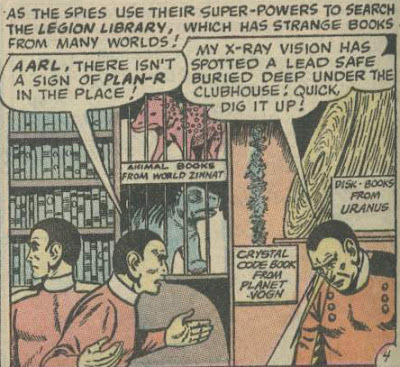 The Legion shows up and shuts down the machine that the aliens used to make their super-power pills. The end. My belated New Years’ resolution? Not to do crap like this again. Next up: old familiar territory redux!